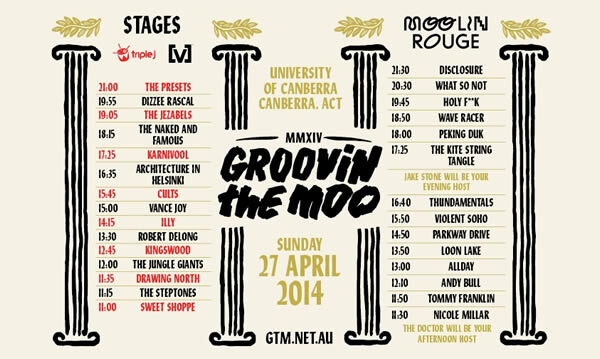 One of Australia’s most popular regional music festivals Groovin the Moo will return to The Meadows at University of Canberra this Sunday 27th April. Now in its 10th year, the all-ages festival is boasting a big name line-up including Dizzee Rascal, The Jezabels, Karnivool, Architecture in Helsinki, The Presets, Disclosure and many more. Canberra’s own electronic music duo Peking Duk will also make an appearance behind the decks at 6.00pm on the Moolin Rouge stage. The afternoon will be hosted by Triple J radio presenter and Frenzal Rhomb guitarist Lindsay ‘The Doctor’ McDougall. Convinced? There’s still time to grab your tickets!